The previous post was about the cold, this post is about warm weather. Waikiki Beach! What is there not to like about that place? 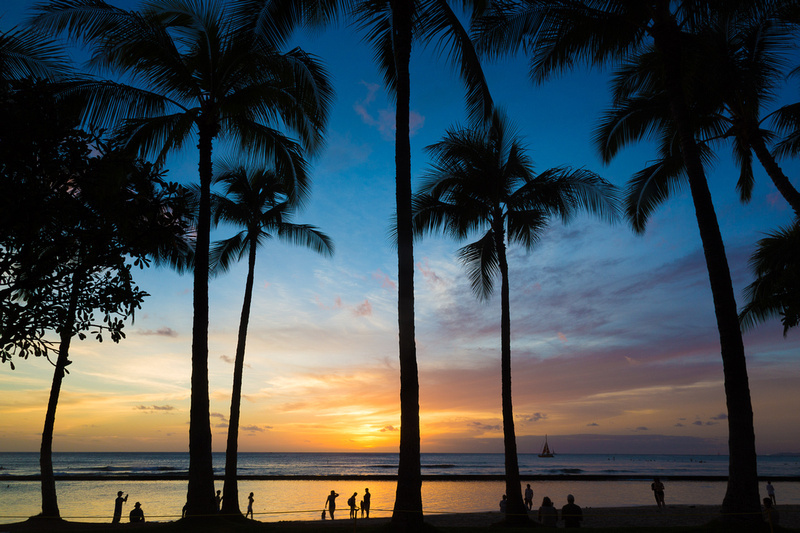 Mid-winter here and kinda miserable, but, after checking the weather channel, still a wonderful 80F (27C) in Honolulu! This shot was taken last Novemner and the temperature then was . . . 80F! How’s that for perfect weather? I remember this evening well, beautiful sunset and just a perfect evening for a stroll on the beach. Bare feet, T-shirt, shorts sweet smell of Plumeria blossoms in the air, my lovely wife at my side . . . paradise! How I wish I were there right now . . . . .
Great comp and I like that sky. Great image ./ Excellent !! !